Set in the depths of a tropical jungle and loaded with special features such as bonus games and wild symbols, Microgaming’s Big Kahuna challenges players to win a top jackpot of 8,000 coins. Big Kahuna comes with 9 paylines and players are required to activate as many or as few of them to start playing this game for real money. The game allows a maximum coin bet of five per active line. Players can also choose from a coin denomination range of $0.01 to $2.00, which makes $90.00 the max bet for this slot. The game is available for instant play or download. Big Kahuna, a Microgaming online video slot packed with exciting features, is based on the tropical jungle theme. It treats players to rich graphics, jungle imagery, and juicy fruits. The reels, which are set against a tropical jungle, feature symbols of tribal chiefs, komodo dragons, kiwis, oranges, litchis, watermelons, pineapples, raspberries, and other luscious fruits. Players are encouraged to join the village chief and become local heroes by saving the residents from dangerous jungle creatures and volcanoes. They will be amply rewarded with coins for their heroic feats. 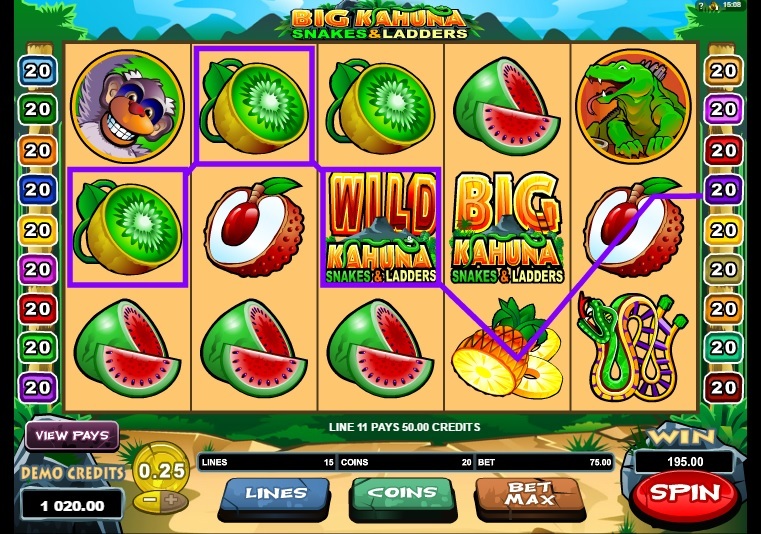 Big Kahuna slot features scatter symbols, wild symbols, and bonus features. The Big Kahuna Game Logo serves as the wild, substituting for all symbols except the scatter and the bonus symbols. If players line a combination of five Big Kahuna symbols along an active payline, they will win the top jackpot of 8,000 coins. Big Kahuna has three scatter symbols—the Volcano, the Tiki Mask, and the Monkey symbol. If players spin combinations of at least two Monkey symbols anywhere on the reels, they will win attractive scatter payouts. The appearance of at least three Tiki Mask symbols triggers the Pick a Mask bonus game, and the appearance of at least three Volcano symbols triggers the Volcano bonus game. The Pick a Mask bonus game displays 10 tiki masks and challenges players to select any of them to win bonus cash prizes. The game comes to an end if players click on a mask that reveals the Collect symbol. The Volcano bonus game challenges players to offer fruit offerings to the volcano and win attractive bonus prizes. But players can choose just one fruit offering for the volcano. Thanks to its bonus features, Big Kahuna is one of the most lucrative slots in the Microgaming portfolio. Players can not only win the top fixed jackpot of 8,000 coins, but also up to 2,500 coins in the Volcano bonus game and as many as 4,375 coins in the Pick a Mask bonus game. This makes up for the lack of free spins and attracts a large number of players. Those interested can play Big Kahuna at any online casino powered by Microgaming.